Animal owners are generally healthier and happier – but if you’re not ready to fully commit to your own pet. Here are some great ways to enjoy part-time companionship with a furry friend. According to the RSPCA, owning a dog can cost up to £13,000 over its lifetime, while owning a cat will set you back £9,000, so sharing a pet seems like a plausible option. Shared ownership is when one person buys a pet, owning it officially, and then two individuals split the cost of its upkeep and share the responsibility of looking after it. Sites such as www.yours2share.com can put you in touch with like-minded people. If you’re experienced with animals, you have the option to foster a dog, cat, horse or pony that’s waiting to be rehomed. Animals need to be fostered for a variety of reasons. “Dogs will always be happier in a family home than in the stressful environments such as kennels,” explains holistic vet Richard Allport. How long you foster the pet for can vary from six months or longer, to just a few weeks – cases will be assessed on an individual basis. If you have children, charities will recommend a suitable animal, but be prepared for tears when your four-legged guest has to depart. Contact www.rspca.org.uk for more information. By using the site www.borrowmydoggy.com, you can connect with people who are looking for someone to help take care of their pet – for a few hours or even potentially a few days. “In many cases, you will be caring for a dog that would have been left alone otherwise, providing it with exercise and love – so you’ll benefit from the situation,’ says Pippa Hutchinson. “You should have some experience to do this and could perhaps volunteer at a local rescue centre first to get used to looking after animals” she suggests. Boost your fitness levels while doing something for a good cause by signing up to the Cinnamon Trust – a charity that pairs volunteers with elderly people who have dogs that need walking and attention. Walking is good for your health and burns around 228 calories per hour. The service operating nationwide and will pay for any travel costs incurred. “It’s beneficial for you and the dog,” says Richard. If a friend or neighbour is going away, why not offer to look after their pet? “It’s good for animals to stay in familiar surroundings,” explains Pippa. 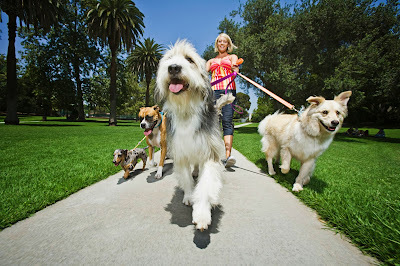 If you have animal experience, you can apply to an agency such as www.animalangels.co.uk – it’s a fast money earner. If you decided to take this route, ensure you take out insurance to protect yourself. If you take care of a pet, or are now considering shared ownership of one – ensure you get them insured! Please visit http://www.discountinsurance.co.uk/other-products/pet-insurance/ for further information.